Dishonored seems to have slipped under most peoples radar so far, but with incredible new trailers such as the one released today, it is only a matter of time until this game is on everyone’s lips. Bethesda and Arkane Studios have been working hard on Dishonored for a while now, and judging by this first cinematic trailer it’s going to be a cracker. Dishonored is an immersive first-person action game that places the player in the shoes of a supernatural assassin. It will challenge you to eliminate targets by combining the numerous supernatural abilities, weapons and unusual gadgets at your disposal. The game also features a choice system but Arkane promise it will be more than simply good or bad, with the world and its inhabitants adapting to how you play. The trailer below is a 4 minute marvel, it does a great job of depicting Dishonored’s world and the struggles it faces. Check it out below. 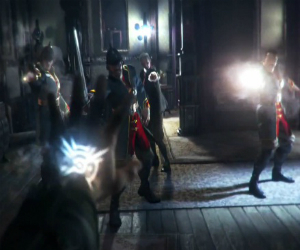 Dishonored is set to hit sometime later this year on Xbox 360, PlaySation 3 and PC. For more information on the game, visit the official website. I like videogames. That is all.